The gamers are the stars in this gorgeously painted spot for PlayStation 'Gamers Masterpiece.' Created by BBH NY and Mill+, it acts as a call to arms for avid gamers everywhere. The creative team began with the initiative to create an epic painting, depicting a replication of the famous crossing of the Delaware. 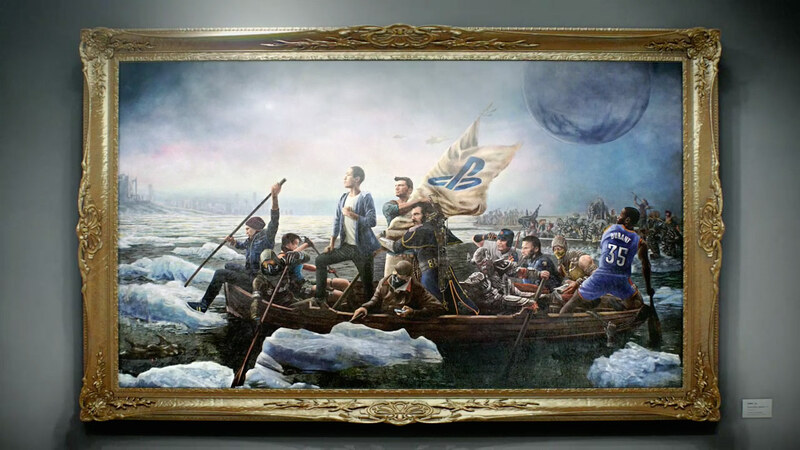 World renowned oil painter Andres Englund created the original work, reimagined with PlayStation's fan voted 'greatest player' in the place of George Washington, surrounded by various players in the games as replacements for the revolutionary soldiers. The question for the Mill+ team remained: How to bring the magnificent oil painting to life? Creative director Rama Allen worked closely with 2D and 3D leads Nick Tanner and Christian Nielsen to explore the technique of painting with oils. From there, the theory of what creates the natural look of a handcrafted masterpiece was delved into in detail. Different levels of varnish, texture and lighting were explored, especially how the layer upon layer of oil paint would interact when animated. The spot begins as a closeup character study, and steadily pulls out to reveal a group sailing into the uncertainty of a game. The sound design amplified this feeling. Rama worked with Henryboy on an anachronistic design, as laser beams are heard in the same space as sword fighting. Now every PlayStation gamer has the chance to be part of their own epic 'Gamers Masterpiece,' by visiting the website. Who will you be?